Magic is an age old art of rejuvenating yourself and delighting your soul. Though it is a gamut of quite old tricks but still appears to be as fresh as ever before. Among plethora of various magic tricks performed card tricks are the simplest and easiest ones but requires hefty practice and deep concentration towards the trick to be performed. Now-a-days there are number of magic card tricks famous by the names such as “Two of a kind”, “Four Jacks”, “It’s all aces”, “Easy Pickin’s”, “Card Kick”, “Three friends”, “Bottom Guess”, “Colour change story”, “Rising cards and glass bottle”, “Redhill 4 Aces”. But the basic phenomenon used behind their performance is twisting, folding, adjusting of hands along with the bluffing and disguising at the backend preparation. There is nothing as such a procedure involved in the learning of card tricks neither there is any rocket science involved. Here seeing is learning and that is what we can try to explain here with the help of elaborating techniques behind few tricks. Let us try to break it down with the simple example of “It’s all Aces”. 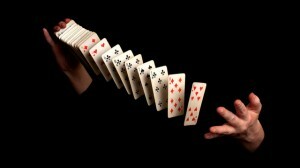 Here a simple back end preparation of putting all the aces on the top of the deck is required. Now performer needs to call anyone among his audience to divide this deck into two piles. Once the process is through ask anyone to repeat it, so that you would be left with four piles. Just remember that a particular pile is topped with four aces. Now it is the time for pretending. Pick any pile besides the one containing aces. Now it is the time to smash top three cards on the bottom. After that it is the time to tackle the top three cards of other piles in the similar fashion. Put one card on the top of each pile. Continue this procedure with other piles. After this procedure is over with all the piles; turn the topmost card of all the piles showing Aces. Once more let us understand it with another example of “Four Jacks”. Separate out four jacks from the deck along with two secret cards. Put the sequence as jack1, secret 1, secret 2, jack 2, jack 3 and jack 4. Now following the same sequence put these cards on the pile of cards. Just drift away audience by saying that these four jacks can’t get away from each other. Pick the topmost jack1 and put it at the bottom. Then pick the second one and put it somewhere in between the pile in a camouflaged manner. Repeat this step with the second secret card. Now jack2 is on the top. Show your audience this card. Cut the deck into two piles. Put the bottom half of pile 2 onto the pile 1 clubbing all the jacks together. After this only fanning out of these cards is left which will divulge all the jacks together in front of audience. We can take any other example of card tricks but ultimately it will be seen that it is collaboration of tricks, bluffing and carrying himself of magician in front of audience which actually creates magic not any sort of miracle. More the acumen one develops for these tricks, more skilled he will become. That is what card tricks is all about.